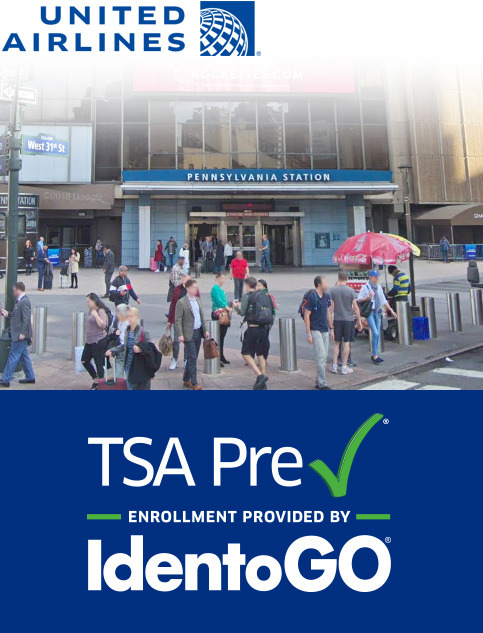 Enroll for TSA Pre✓®, January 7, 2019-February 8, 2019 at Pennsylvania Station, United Airlines Ticketing Office located on the Main Concourse (Amtrak waiting room level) of Penn Station closest to the 7th Avenue entrance, (next to the GNC Store). Enroll now to become part of an expedited screening program that helps take the stress out of travel. Click the Start Application Now button to pre-enroll (10-minute process) and can schedule an appointment to complete the 5-minute fingerprinting process. Use your United MileagePlus® miles to cover the $85 application fee for 5 years of TSA Pre✓®! Government issued I.D. (i.e. Driver’s License), proof of citizenship (i.e. Birth Certificate or Passport), See a complete list of acceptable identity documents. $85 fee for 5-year membership (that's only $17 a year!). Credit card payments only. No cash accepted.